The 2014 Oscars was a glittering and glitzy sight for bored eyes as far as the jewelry goes. After years of begging for more showy jewelry, starlets and stylists finally ditched the studs and donned jewelry more red carpet-worthy. This was a pleasant contrast to more subdued fashions. Nary a jaw-dropping moment happened when it comes to gowns, which isn’t surprising, as celebs usually tend to play it safe at a ceremony of this magnitude. The jewelry of this year’s Oscar night was definitely in the spotlight with all the leading ladies sparkling in several of the major luxury brands. Very noticeable too, was the lack of Lorraine Schwartz pieces this year. In the recent past Academy Awards, her designs have accounted for a generous 60 percent of the Oscar night jewelry list. However, last night, LS was only spotted on one starlet. This year, it was time for other respected jewelers to shine on the runway. Less gown glitz and more bauble bling will be the talk around town as far as Oscar fashion goes for 2014. Here are some of the favorite pieces worn by Hollywood’s finest. Some styles are best only seen once in awhile. That will probably be the case for Jennifer’s backlace, or necklace that swags in the back rather than the front. Worn with a backless and strapless red gown, the Neil Lane platinum 100- carat diamond and rock crystal looked stunning in both back and front views. A $1 million platinum ring set with three fancy-colored diamonds and huge studs completed Jennifer’s look. Sandra’s Lorraine Swartz diamond cluster lobe huggers, along with a vintage-style Alexander McQueen navy gown and side-swept curls gave her a nostalgic Old Hollywood look. Yet at the same time, the ear cuff-like 1.8 million LS earrings were an especially trendy look. Bulgari’s spider web design necklace was the perfect choice to compliment Naomi’s white, sparkly high-neck gown with cap sleeves. The geometric design, touched with diamonds at well-planned concentric points gave it an Art Deco look, matching her Art Deco clutch. She finished off the look elegantly with a diamond pave Serpenti bracelet. With her boyish hairstyle, statuesque, graceful neck and classic black Dior gown, Charlize was the perfect starlet to show off “the necklace”, a diamond drop necklace with a cluster of diamonds at the center from Harry Winston’s revered collection. Counting studs and necklace, Charlize was dripping in $15 million worth of diamonds while walking the red carpet. 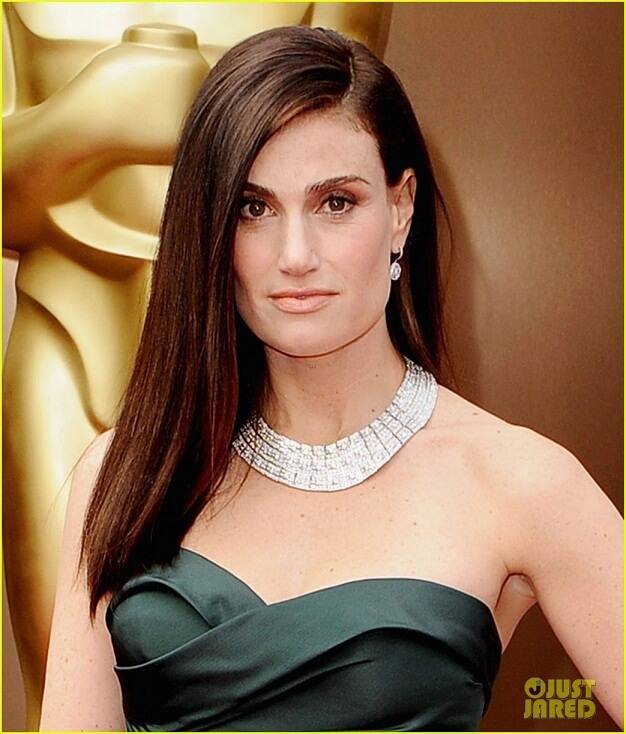 Frozen starlet IdinaMenzel almost blinded the crowd with her Chimento Diamond collar necklace and cuff bracelet. The stunning set is from a Jacqueline Parure Collection. Her midnight green gown along with all that “ice” gave a chilly look that did her Snow Queen title role great justice. Frozen princess Kristen Bell was not to be out done when it came to “ice.” She wore plenty of it, compliments of Piaget. A delicate diamond vine necklace was perfect for her petite stature and complimented her and intricately woven sparkly gown. Best supporting actress winner LupitaNyong’o was delightfully feminine wearing Fred Leighton from head to fingers. An 18K yellow gold and diamond head band along with a “Nairobi blue” Prada gown with tiny pleats was decidedly girlish. The 18th century Fred Leighton bracelet, a yellow gold and diamond coiled snake gave her look a sort of Cleopatra style. Stacked rings were a 19th century yellow gold ring set with diamonds and pearls, 18K Frog ring in yellow gold, 19th century opal ring set in yellow gold and a 1960s turquoise and diamond ring set in 18K gold. Trendy cluster-lobe earrings brought her back into this century.